Born at Gladstone on 6 May 1889, son of Christian Fahrni and Priscilla Hyndman, he was educated at Gladstone School and Wesley College. He articled in law to J. Scott Cameron and A. E. Jacob of Gladstone and was called to Manitoba Bar in 1916. He became a partner in the law firm of Jacobs and Fahrni and, on the death of his partner, he carried on alone. He was solicitor for the Bank of Commerce, Northern Trust Company, Canada Trust Company, and Huron and Erie Mortgage Company. He was appointed a County Court judge in December 1943 and served until retirement in 1967. He was made a King’s Counsel in 1931. On 6 May 1915, he married Edith Josephine Minaker at Gladstone. They had two sons and a daughter. He served as President of the Gladstone Board of Trade, and was a member of the AF & AM, Canadian Bar Association, and Manitoba Law Association. 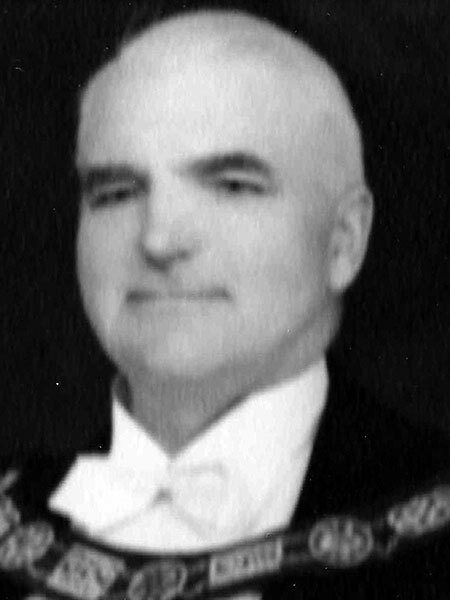 He served on the Executive of the Manitoba Historical Society and was Grand Master of the Grand Lodge of Manitoba (1942). He died at Vancouver, British Columbia on 25 January 1975 and was buried in Gladstone Cemetery. “Six Manitoba lawyers named King’s Counsel,” Winnipeg Free Press, 1 January 1931, page 1. “Three county court judges appointed,” Winnipeg Free Press, 31 December 1943, page 1. Obituary, Winnipeg Free Press, 7 February 1975, page 21.